Last week my parents took me over to the old ice plant to procure seafood for an upcoming family gathering. Going to the ice plant, now known as Sea Farms, is somewhat of a walk down Memory Lane for my father, who worked here briefly as a teenager. My father has a good rapport with the owner and the folks who work there, and it was nice to see him so animated and happy on our visit. He's been mourning the loss of his good friend and our neighbor Sidney. We bought some tuna and several pounds of Carolina shrimp and happily made our way back outside. I'm looking forward to the next visit. This recent Queens Creek sunrise was not just great, it was glorious. I only usually catch them, the sunrises, on my way out the door for work. The sunsets have been equally spectacular, but since I face east and my westward-facing yard is full of trees, I rely on my local Facebook friends to post pictures of those. Which is how I know they've been grand. The sunsets. As usual, there is a lot to report but no time to do so. On the heels of our neighbor's passing, there has been more sad news. A Mathews family very near and dear to us is suffering the untimely loss of a son/grandson/nephew. It's heartbreaking. Only two weeks sit between now and Daughter's return to her last year of high school. It wasn't that long ago that we were dropping her off at preschool, where she never uttered a single word unless the teacher called on her. These days, she's still quiet for the most part, unless she's asked a question. Her favorite topics include her wonderful job at Merroir or the latest and greatest with her friends. I'm just grateful and honored to be her mother. 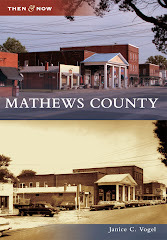 This building in "downtown" Mathews used to be Twigg Motor Company and, later, Christie Chevrolet. Based on the signs, it looks like cars will continue to be associated with this building in the future. Speaking of cars, this weekend I'll be doing something for the first time in my 50 years on this planet: attending a drag racing event. Saturday I'll be just outside of Richmond (here) broadening my horizons and participating in some very serious car- and people-watching. There will also be consumption of french fries, I've been promised. Although my mother and daughter appeared simultaneously stunned and slightly horrified when I told them where I was going, I'm very much looking forward to a new adventure. Son departs for college this weekend, and Daughter just took her senior portraits. I think the drag races will be a nice distraction from the fact that in less than a year I will be an empty nester. These were taken earlier this summer from Aaron's Beach. I'm very negligent in my photo-taking duties, but it's been a whirlwind summer that doesn't seem to be letting up. This is Son's last week at home before returning to UVA, and his 20th (!!) birthday is Thursday. Daughter is gearing up for her senior year and the whole college application process. And my work continues to pull me in multiple directions. Also, our neighbor Sydney died last Friday. Sydney has been our close neighbor since before I was born, and he was my father's good friend. His passing is just another reminder that time is passing all too quickly, and our time to enjoy this life is neither guaranteed nor unlimited. I've been doing my best to enjoy what spare time I have, which has resulted in no pictures and no attention to this blog. I have been enjoying a lot of the local music scene and have probably seen more bands this summer than I have in my whole life. Middle Sister is also doing her best to drive me crazy keeping me busy in the evenings, and we try to get out to eat about once a week after work, which is nice. So, there's lots happening here lately, but at some point I'll venture out to take some new pictures. There's simultaneously lots to report and nothing to report. Most of all, there's no time to report the lots or the nothing. Instead, I share this recent sunrise from earlier this week, which pretty much says all that's needed.